Michelle Bolsonaro has been the First Lady of Brazil, since 1 January, 2019. She was previously a parliamentary secretary of the Chamber of Deputies. She is the daughter of Maria das Graças Firmo Ferreira and Vicente de Paulo Reinaldo. Michelle is married to the President of Brazil, Jair Bolsonaro. She has two children, including a daughter with Jair. I have blue eyes and my wife is of African descent. My father-in-law lives in Ceilândia, he is known in his circle of friends as Paulo Negão. He is not black, it is a mixture of Portuguese, black, and indigenous. 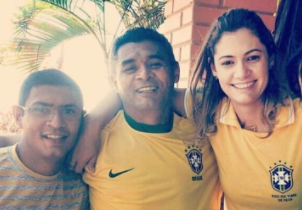 Michelle’s paternal grandfather was named Damásio Reinaldo de Souza. Michelle’s paternal grandmother was Tarcisa Gomes Batista (the daughter of José Gomes da Silva and Antônia Tôrres Batista). Antônia was the daughter of Honorato Martins Tôrres and Francisca Batista Albuquerque. Antônia was the daughter of Honorato Martins Tôrres and Francisca Batista Albuquerque. In the interview you have linked I think he has tried to fool some strata of Brazilian people, just like he is saying “I am not racist” and stuff, because his wife is definitely “branca” (white) and she would not stand out in the motherland Portugal too. She looks like an average white Brazilian person from Sao Paulo or Rio, I mean 80/90% genetically European. I would say around 70% European, if that. She certainly has the “typical Brazilian” background, which is common in all regions, except the South. _ “typical Brazilian” background, which is common in all regions, except the South.